Puppies are fun, loveable, full of energy—and often require a different level of care than older dogs. That’s why some sitters may choose to charge a different rate for watching or walking puppies. What age is considered a “puppy”? Dogs under one year of age are considered puppies. 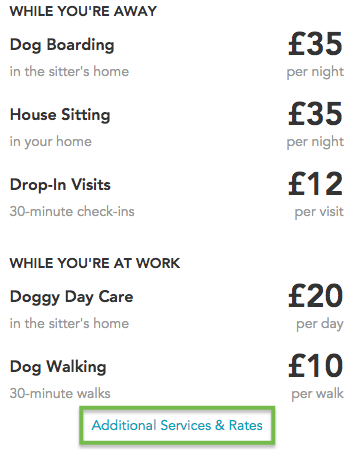 If your sitter or dog walker has a special puppy rate for your chosen service, that rate may apply to your booking if your dog is under one year old. How can I find a sitter’s puppy rate? 1. Navigate to the sitter’s profile and on the right you’ll see a basic list of services they offer and their corresponding rates. 2. At the bottom of that list, select Additional Services & Rates. 3. If the sitter has a special puppy rate, you’ll see it listed here. They may offer different rates for different services, so be sure to review each one. If you have questions about a specific sitter or dog walker's rates, you can always send them a message. For more details on contacting sitters and dog walkers, check out the related articles below.